His wife recalls: “He could sit all day in a hard chair.” His editor observes: “A banker’s son who never knew affluence or leisure, Richard Power seems rarely to have known an unproductive moment.” James MacKillop skillfully arranges 16 Power stories into a satisfying chronicle of Irish, largely during the postwar era, who grow up and face the hard struggles of a land with few prospects for security or sanity. Powers, although he was Dublin-raised, was like so many of his fellow city residents born to a family from the countryside. Having learned the Irish language to native fluency in school, he wrote in it as well as in English. On his merit he was singled out and sponsored for a university degree, and later for a MFA at the University of Iowa. MacKillop introduces the reader to Richard Power, as outside his native land he is not widely remembered. His deft account of a sly village priest, The Hungry Grass, was published to critical acclaim just before he turned 42. He died in his sleep immediately after, during the winter of 1970. He left his wife with six small children. He left the presses with little of his work in print, until recent reprints of that novel and a first, The Land of Youth. This welcome debut collection of his Irish stories will find ready readers overseas. Within the generation of Edna O’Brien, Brian Friel, Aidan Higgins, Benedict Kiely, Brian Moore, and John McGahern, Power compared and contrasted himself with these rivals as he wrote prolifically between 1950 and 1970. His unsparing, alert eye resembles McGahern’s sharp gaze on a still largely rural, custom-hobbled Ireland, but as Power himself claimed, without his peer’s animus against the Church. Perhaps this is due to the fact that Power’s brother became (for a while) a priest as well as translator of some of Richard’s fiction in that tongue. One of these efforts is included in bilingual format, and it allows those with some Irish to study the choices Victor makes. These reveal the intricate and inevitable differences in register between these two languages. What both creations show is Richard Power’s command of dialogue and observation. In this as well as the arrangement made by MacKillop, Joycean echoes reverberate. The inclusions come in order of chronology from childhood to adolescence to marriage and parenthood. They may not be as grim as Dubliners, but the more awkward style of some of those placed earlier in this anthology draws attention to the command of his form which took Power a while to master. Not that the first are weak; the title story opens the collection with a powerful evocation of a school where its master contends against his students for control. This turns towards a vague past but likely not one before the twentieth century. 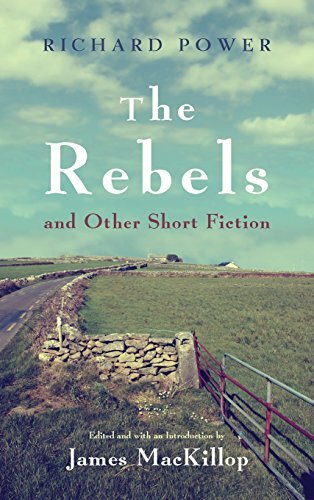 It conveys, in neatly metaphorical form, the contention for loyalty, the urge for rebellion, and the pressure to conform which occur throughout Irish literature. Yet as with his predecessor in the Department of Local Governance, Brian O’Nolan/Flann O’Brien/Myles na Gopaleen, one wonders whether Richard Power wandered into nightly diversions luring him away from his talent on the page. MacKillop’s appendix tallies over 50 short stories, 13 plays, six film scripts, journalism, and some of this oeuvre remains pseudonymous or unsigned. However, as his editor and his wife concur, Power’s diligence during his “free time” cannot be gainsaid. The evidence in the stories proves this. As they progress, they slowly turn less grim. This happy easing of tension toward dramatizing the trope of stern Irish mores may exist throughout his work, of course. But MacKillop’s editorial arrangement heightens the charm that enters the later selections, and the pacing which improves their telling. This too shows Power’s command, as in Joyce’s Dubliner, for timing and rhythm. It may also attest to his ability to listen to his inspirations. His County Waterford familial origins and his facility with Irish allowed him, unlike many of his national contemporaries vying for print, insights into thought and expression through the “first official language” of the new nation. And as in “Republicans,” Powers alludes to the fractious wars for independence and then command of the partially independent land. That he does not harp on these “troubles” displays his admirable tact and appropriate reticence, for those with whom Powers worked and lived had to keep their own allegiances circumspect, as they were already known and filed away in a small nation. The blurred boundaries between urban and rural color “Neighbors” subtly. A graphic designer drafting commissions for the Cultural Relations Institute “suffered from the dour suspicions of the self-taught that merit really counted for little.” Given Power’s insight into the duties of the government functionary and the difficulties of a self-made man striving to make his mark in the arts, the conflict his protagonist finds himself trapped by when dealing with what would now be politely labeled as “itinerants” does not seem schematic, but the hapless result of everyday, entangled disdain. In the story which would expand into his debut novel, bitter barriers set up by a couple who have fallen apart on an unforgiving, tattle-telling island result in one of the many funerals peppering this collection. “The graveyard was before us on a sandy hill, headstones pressed into its summit like a crown of thorns.” Not the most understated image, but Power as with so many of his fellow writers prefers the dour. Luckily for those impatient with tales of woe, the most entertaining inclusions conclude these couple of hundred pages. The vexed difficulty many Irish Catholics may remember in trying to eke out clues about a stranger’s sectarian allegiance, an advent of the (then illegal) Pill, promising allusions to fairy tale motifs, and the remnant of a Midwest campus novel comprise the last entries. A valuable glossary informs one of Irish-language terms and others filtered into Hibernicisms, and the bibliographical research and further sources will assist researchers who follow in the steps smoothed out by James MacKillop to enable U.S. readers to catch up with the imagination of Richard Power. Now, if Syracuse University Press could reprint The Land of Youth and The Hungry Grass, audiences apart from Ireland may be rewarded.